SilcoNert 2000 coating eliminates surface adsorption and reactivity, making reliable stack and flare sampling a reality. The last 15 years have shown an increasing need for inert coatings to improve analytical results obtained in systems used for mercury and sulfur sampling. Regulations for mercury emissions from coal fired boilers are now enacted while flare gas regulations (subpart Ja) are being phased in. Accurate analysis of part-per-million and part-per-billion levels of sulfur containing compounds in stack and flare emissions are critical to meeting new regulations for low level sulfur. Many organo-sulfur compounds, like hydrogen sulfide (H2S) adsorb to metal surfaces. Stack and flare sampling is challenging enough without having to contend with seemingly random loss of sulfur and mercury samples. Even one uncoated flow path component can adsorb reactive compounds; causing loss of sample, calibration failures, and endless system troubleshooting. SilcoNert and Dursan virtually eliminate adsorption, improving system reliability, reducing calibration failures and troubleshooting. Want to learn more helpful sampling tips? Even stainless steel is reactive to mercury, causing loss and adsorption. Mercury loss can be impacted by system design and environmental factors. Additionally, trace levels of H2S can act as a catalyst for reaction of mercury with iron oxide contained in sample pathways and analytical instrumentation. SilcoNert 2000 coated sample pathways make even part per trillion sample mercury and H2S sampling possible. 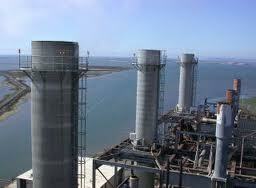 Allowing operations to detect process upsets earlier or trend emissions before an out of compliance condition occurs. Emissions of mercury in coal flue gas from boilers is now a monitored pollutant. 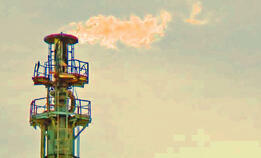 Effluent from refining, petro activities are also monitored. Power plants and refiners have difficulty monitoring mercury due to oxidation and adsorption/loss due to surface activity. Coatings applied to sample probes, transfer lines, and inertial filters eliminated adsorption. How the sample is taken makes a big difference in overall test accuracy. Samples taken in the laminar section (the middle) of the flow profile through a SilcoNert® coated sample pathway will give a real time representative sample of the stream. SilcoNert® 2000 and Dursan® will conform to the most intricate surfaces while maintaining high dimensional tolerances. SilcoTek coatings will deform with tubing surfaces allowing for radius bends and will not interfere with threaded or compression joints; making our coatings ideal for process, refinery gas, stack, and flare sampling. 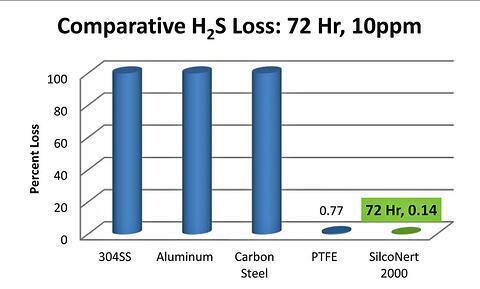 Comparison of sulfur transport properties of 100 foot lengths of SilcoNert® 2000 treated, electropolished, and raw commercial grade 1/8in OD x 0.020” wall stainless steel tubing. Demonstrates uptake of 500 ppmv methyl mercaptan sulfur compound by the 3 tube surfaces. 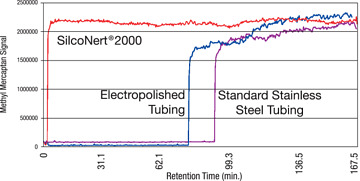 SilcoNert® 2000 treated electropolished tubing did not adsorb the methyl mercaptan to any measurable extent, delivering a representative sample with no delay. The untreated electropolished tubing totally adsorbed methyl mercaptan for more than 75 minutes, the sulfur gas level did not stabilize until 130 minutes. Conventional 316L seamless tubing totally adsorbed methyl mercaptan for more than 90 minutes; the sulfur gas level did not stabilize until 140 minutes. 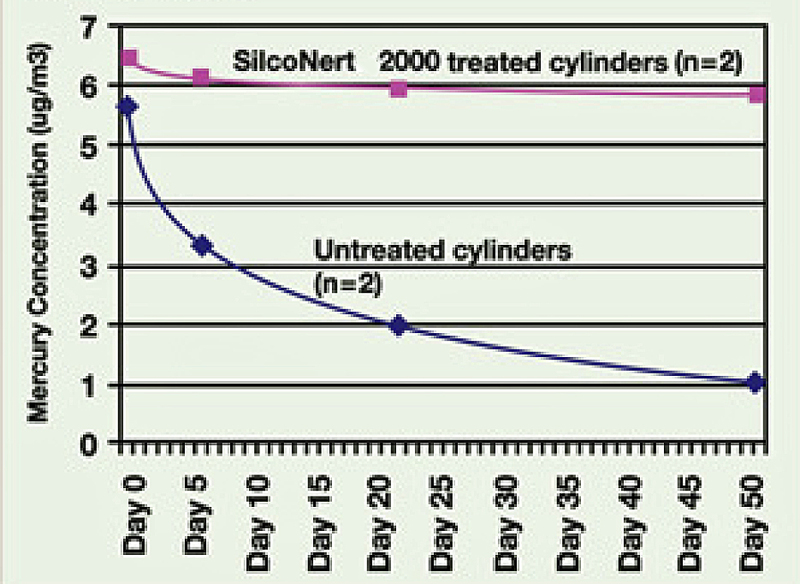 SilcoNert® 2000 treated sampling and transfer equipment results in more accurate sampling and faster cycle times. 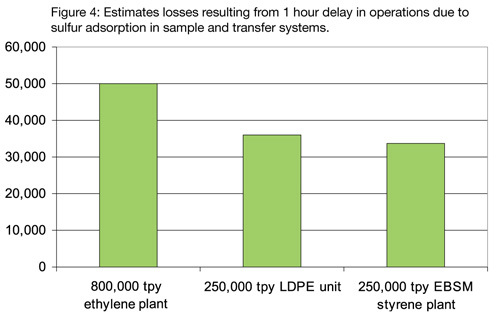 A 1 hour delay in operations can cost an 800,000 tpy ethylene plant $50,000. A 250,000 tpy LDPE unit will cost operations $36,000 for a 1 hour upset while an EBSM styrene plant will cost $33,000. To learn more or to get a quotation for sending your parts to SilcoTek® for coating services, visit our web site at www.SilcoTek.com or call us at 814-353-1778. 1. D. Smith, D. Shelow, G. Barone; “Instrument and Sampling Equipment Passivation Requirements to Meet Current Demands for Low-Level Sulfur Analysis”; Presented at Gulf Coast Conference, 2001; Restek Corporation, Bellefonte, PA 16823. 2. Application of TrueTube(tm) in Analytical Measurement Cardinal UHP, August 2004. The authors thank the staff at Shell Research and Technology Centre, Amsterdam, for data used in evaluating sulfur gas uptake and memory effects of tubing substrates.